The news agency BNA is reporting that the president appears likely to release his proposed draft of a transportation bill soon. The administration is circulating a partial draft of its proposed bill [PDF], signaling that a release could be imminent. The administration rarely writes its own legislative language to submit to Congress, and indeed, the language that comes out of the House and Senate committees with jurisdiction over transportation will be more significant, as those are the bodies that eventually vote on the bill. Still, this is the first look we’ve seen at official legislative text. Snider reports that one significant addition is more information on a program to allow states to do their own environmental impact statements, to avoid letting projects get bottlenecked in the federal pipeline. This issue came up many times in House and Senate stakeholder meetings. Especially in the context of a small bill, people are looking for efficiencies and savings everywhere they can, and the environmental review process has been identified as a prime place to speed up project delivery. 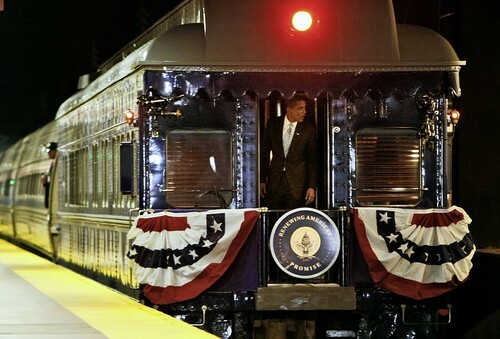 Whether Obama’s bill is submitted to Congress over today or next week, we can expect to see it soon, as both houses are getting down to business on their own versions of the transportation reauthorization, which they both want to pass out of committee by Memorial Day. This must be outdated – the attached draft talks about a National Infrastructure Innovation and Finance Fund which was part of the FY2011 DOT budget request. Obama’s FY2012 budget request seeks to establish a National Infrastructure Bank – unless the administration has again backed away from that effort. Hopefully the final comes out soon. No mention of New Starts or public transportation in specifics…I assume this part is not yet complete? Patrick – the draft is divided into several parts, only one of which I was able to get. The section I got, the first, cuts off right after the highway title. New Starts and transit stuff is in the second part. I’m not sure if that’s even been given to stakeholders yet. David – It might be slightly outdated but is not that old. I believe it’s as simple as the administration not settling on a name for the darn thing. It was an infrastructure bank in the FY10 budget request, then the NIIFF in FY11, then back to the bank for FY12. The draft also includes several funding authorizations, such as for high-speed rail, that were not revealed until the February budget request, so it is at most two months old, though I suspect it’s only a month old, at most. Let’s see if Obama can top SAFETEA-LU for an incomprehensible acronym. If this is the real deal, interesting to see that TIFIA — the federal loan program — gets rolled into the national infrastructure finance fund. That could have implications (probably good) for L.A.’s 30/10 plan.